Dog care tips for a new puppy or adult dog. Includes dog health, dog obedience, how to groom a dog, and basic dog supplies. Dog breed information for all types of dogs, what to look for when choosing a dog breed, and the most popular dog breeds. We are looking for a loving, forever family home for our 5 month old, beautiful 'Luna' and presly, chihuahua pupsl.They are all full enthusiasm, playfulness, are loving and affectionate. They have a great personality and love attention! they were imported from Lamma Islands, completely house trained, crate trained and sleeps through the night and are currently being lead trained. they are through their teething phase and are fully vaccinated for the next year and are licensed . We will only let them go to a loving family who will care for them with a big heart. they are great around children, adults and other dogs. It would be beneficial if you have outdoor space/garden near by for them to run free and you must be knowledgeable and prepared to care for puppies, in particular this very gentle breed. Due to lack of free time as my company gained a market in the construction of 3 football field i will be busy for quite some years. The Labrador Retriever is the most popular dog breed in the world! The Labrador is classified as a sporting breed, but is best known as a companion and working dog. Its beginnings are from the island of Newfoundland where it was used to retrieve and pull fishing nets out of the water for fishermen. When introduced to England in the 1800's its retrieving instincts were further refined. Today this multi-talented dog is often used as a service dog and is sometimes employed by the police as a drug-sniffing dog. This breed is commonly discribed by its color variation as a Black Lab, Yellow Lab, or Chocolate Lab. These are all Labrador Retrievers. 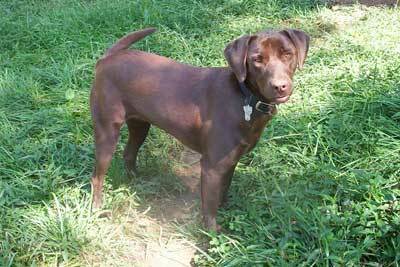 There are also Silver Labs which the AKC considers a variation of Chocolate Labs. And then there is a rare variation in coloring that has a pinkish nose and eye rims, it is known as a "Dudley." The exception is the Golden Labrador, this is actually Labrador and Golden Retriever mix. Labrador Retrievers are beloved for their affectionate and gentle nature. They are known for their great ability to get along with everyone, though may be apprehensive of strangers if not socialized properly as puppies. They are very playful and want to be treated like part of the family. They can be trained as guard dogs, and they also possess a number of other talents. They are favorites of duck hunters, and they do well in agility and competitive obedience. When selecting a Lab, be aware that the breed is prone to joint problems, eye problems, and hereditary myopathy. Captain the dog retrieves 2 Frisbees underwater in one dive. Labrador Retriever, Labrador, Lab. These breeds are commonly named by their colorations as well, being the Black Lab, Yellow Lab, or Chocolate Labs, and a rare variation in coloring that is known as "Dudley". The Labrador Retriever is classified as a sporting breed, but is best known as a companion and working dog. The Labrador is the most popular dog breed in the world according to registration records. The Labrador Retriever hails from the island of Newfoundland. Its ancestors include the Newfoundland, the St. Hubert's Hound, and various European pointer breeds. The Labrador was used to retrieve and pull fishing nets out of the water for fishermen. The breed's retrieving instincts were further refined in the 1800s, when it was introduced to England. Today, the Labrador is often used as a service dog. It is also sometimes employed by the police as a drug-sniffing dog. Varieties include the English Lab, which has a thick build, and the American Lab, which is taller and lankier. A rare variation in coloring is known as "Dudley." These yellow Labs have pink, liver or flesh-colored noses and rims around the eyes. Popular Lab hybrids include the Labradoodle (Labrador and Poodle mix), the Golden Labrador (Labrador and Golden Retriever mix), and the Labradinger (Labrador and English Springer Spaniel mix). The Labrador has a solid build, with a broad head, wide muzzle, and thick, tapering tail. Its eyes are chestnut or hazel, and the ears are of medium size and pendant. The feet are webbed, making swimming easy. The coat is short and hard, with no wave. Colors include black, yellow and chocolate. There is also a silver coloring that the AKC considers a variation of Chocolate. Male Labs are 22 to 24 inches tall and weigh 60 to 75 pounds. Females are 21 to 23 inches tall and weigh 55 to 70 pounds. A Labrador Retriever needs a diet low in carbohydrates and high in fat. Recommended food sources include fish, poultry, lamb, and green vegetables. Labradors do not require a great deal of grooming. Regular brushing and as-needed bathing are all that is necessary. Too much bathing could damage the natural waterproofing of the coat. A Lab sheds moderately, but continuously. If kept indoors, regular vacuuming will be necessary. Labradors make good housedogs as long as they get enough exercise. They need a yard of adequate size to run in. Labradors are known for their ability to get along with anyone. Despite their large size, they are great with children due to their gentle nature. They may be apprehensive around strangers if they are not well socialized as puppies. Do very well with other pets. The Labrador Retriever is a very intelligent breed, and it trains quite easily. It does well in shows and competition, and can be trained for a variety of work and sport purposes. Labradors need plenty of activity to keep them happy and to prevent weight gain. They need to walk, jog or run daily, and they love to run and play off-leash as much as possible. Working and hunting dogs can get a portion of their exercise through those activities. When seeking a mate for your Labrador Retriever, check bloodlines for deafness, hereditary myopathy, autoimmune disease, and hip dysplasia and other joint problems. The eyes of both dogs should be examined prior to breeding. Ear infections are common in Labradors due to the design of their ears. You can help prevent this by clipping the hair around and under the ear, and by checking the ears regularly for signs of problems. Obesity is also a frequent problem, and can lead to other ailments. Proper diet and plenty of exercise can prevent weight gain. Labrador Retrievers are widely available, and breeders can be found virtually anywhere. Prices average between $500 and $1,000. This Labrador Retriever page is a good place to start. In 2013 i.e. recently, I found a local pariah [street] dog puppy playing in the roadside and I brought it home. My wicked old grandmother told me to throw him outside but I did not listen to her. For 8 to 9 months he stayed with me. But one problem was there and it was that he excretes in the home and therefore one day my grandmother secretly sent him somewhere with the help of my uncle. When I came to know about it I cried bitterly. Till today she didn't tell me where she left him. I miss my dog very much. Now I had decided to buy a yellow lab and I can gurantee one thing that no one can separate him from me. Dear Nihar Gawand, I also need a labrador Retriever ! Because I luve Labrador but I couldn't find any> . . .
Ditto to you Tiara, see bob's comment below. I own a 3 years old female black Lab Magie she loves walks swimming and especially sleeping. My dad feeds her rice mixed with chicken soup on somedays and sometimes bread (wheat) mixed with milk is this diet ok she weighs around 65 to 70 pounds is this diet ok for her?